We’d love your help. Let us know what’s wrong with this preview of One Day at Fenway by Steve Kettmann. Now in paperback—a cross between A Day in the Life and Moneyball—comes the inside, intertwining stories of famous, and not-so-famous people as their lives are affected by one day of baseball: August 30, 2003, Red Sox-Yankees at Fenway, during their most famous season ever. Fenway Park, Saturday, 8/30/03: Yankees versus Red Sox. Not just a special day in a historic rivalry b Now in paperback—a cross between A Day in the Life and Moneyball—comes the inside, intertwining stories of famous, and not-so-famous people as their lives are affected by one day of baseball: August 30, 2003, Red Sox-Yankees at Fenway, during their most famous season ever. To ask other readers questions about One Day at Fenway, please sign up. Great book to read if you're a baseball fan. Baseball. The mythic American pastime. Is it still relevant? Is it still the American pastime, in this age of football? I'd say no. Baseball is dying. For me, it died a lot when the players canceled a season over money, and the rest of it died when my beloved San Francisco Giants sold their past few seasons away in exchange for the merchandise and publicity that a steroid stuffed monster can bring. However, this book is a great ode to what is good about the game, the way that it brings families Baseball. The mythic American pastime. Is it still relevant? Is it still the American pastime, in this age of football? However, this book is a great ode to what is good about the game, the way that it brings families together, the way that it captures the wonderful feeling of "going" to a baseball game. That's why baseball is dead, because you have to be there to enjoy it. Baseball is one of the absolute worst sports to watch on TV, unless you are simply obsessed with it and have no stadium nearby. Bad baseball in person is much better than great baseball on TV. Oddly enough, baseball is also very good on the radio, if you have a good announcer. But it is terrible on TV. I can think of a handful of great baseball games that I've enjoyed on television, and even in those my attention wandered and I walked in and out of the room. Written in late 2003, this book details much of what happened around one game in late August of that year between the Red Sox and Yankees. Many big personalities from both teams are involved, along with a few outsiders (e.g. Spike Lee and Bob Adair). While enjoyable to read, it is not without flaws. The first half introduces many of those personalities and covers what they do between the previous night game (a Sox win) and this one. The second half of the book is an inning-by-inning breakdown of Written in late 2003, this book details much of what happened around one game in late August of that year between the Red Sox and Yankees. Many big personalities from both teams are involved, along with a few outsiders (e.g. Spike Lee and Bob Adair). While enjoyable to read, it is not without flaws. The first half introduces many of those personalities and covers what they do between the previous night game (a Sox win) and this one. The second half of the book is an inning-by-inning breakdown of the game, which is an interesting read. The book ends with a postscript saying that these Red Sox seem to be ready to shake up baseball, and predicts a world series in in the near future. As this book was released in August of 2004, it was a very near future indeed. While Fenway provides the backdrop, little is said about the old park. Some of the personalities fill no more than a walk-on role, author Robert K. Adair unfortunately among them. The book is extensively researched, and most likely very accurate. The slight lean of the book indicates the author is likely a Yankee fan, or at least from New York. Kettmann takes us to August 30, 2003 at Fenway Park in Boston. Yankees v. Red Sox in the second game of a three game series on a Saturday. Andy Petitte pitching for the Yankees against Pedro Martinez for the Res Sox. Joe Torre v. Grady Little. You get views on that day from the owners, general managers, managers, players, groundskeepers, scoreboard keepers and fans both famous, and not so famous. You get the feelings of what it is like to watch a game at Fenway with great insight from all those Kettmann takes us to August 30, 2003 at Fenway Park in Boston. Yankees v. Red Sox in the second game of a three game series on a Saturday. Andy Petitte pitching for the Yankees against Pedro Martinez for the Res Sox. Joe Torre v. Grady Little. You get views on that day from the owners, general managers, managers, players, groundskeepers, scoreboard keepers and fans both famous, and not so famous. You get the feelings of what it is like to watch a game at Fenway with great insight from all those connected with the game, inning by inning. I love baseball and have been to all the current MLB parks and 47 overall. This book is unique in that it takes you to a regular season game between to of the greatest rivals in sports (although I think the Giants/Dodgers series is more intense). The game then plays out like you were there watching it. Great read in the bitter January weather. Just good fun!!! A lot of great stories all centered on one baseball game. If you watch "Fever Pitch", check out the book our star is reading!!! Again, good fun!!! 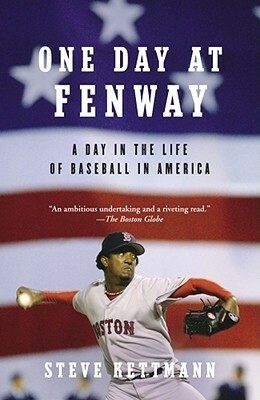 "One Day at Fenway" is a well-written book that any baseball fan, especially a Red Sox or Yankee fan would enjoy. As a proud member of Red Sox Nation & a true New Englander, I highly enjoyed Mr Kettmann's book & felt that he conveyed the loyalty of the *true* Red Sox fans who stick by their team through not only the good but also the bad, he also did a great job at portraying the strong Yankee/Sox rivalry. I had a hard time putting the book down & read the book within a few days. There are so many good baseball books out there, it's hard to know which one to pick, but this book is like a time capsule: A look back on what it was like when Sox fans were still unique in having had to wait so, so many years to win a World Series and end the curse. Does anyone even talk about the curse any more? Red Sox/Yankees showdown set in 2003. Enjoyable read for baseball fans of this great rivalry. In a century old rivalry there are era's that are unforgettable. For my generation of Red Sox fans no era was more memorable than the three seasons between 2002-2004. A new ownership group, questions about the survival of Fenway Park, bidding wars between Boston and New York and two words...Game seven. Steve Kettmann's book One Day At Fenway chronicles and captures the raw emotion of this rivalry. Cataloging the events of August 30, 2003, game 2 of a 3 game series in Boston, through multiple eyes In a century old rivalry there are era's that are unforgettable. For my generation of Red Sox fans no era was more memorable than the three seasons between 2002-2004. A new ownership group, questions about the survival of Fenway Park, bidding wars between Boston and New York and two words...Game seven. Steve Kettmann's book One Day At Fenway chronicles and captures the raw emotion of this rivalry. Cataloging the events of August 30, 2003, game 2 of a 3 game series in Boston, through multiple eyes from both Boston and New York. The stakes were high in Boston as the second place Red Sox had one eye on the wildcard slot and the other on the American League Eastern Division pennant. Kettmann (and the team of writers Kettmann credits before and after) follow members of the Red Sox and Yankees top brass, fans of Boston and New York, and managers and players from both dugouts. [John Henry] was looking around the ballpark, taking in the details. He spotted Jason Varitek in the on-deck circle, getting himself ready, and then noticed a small bird that had hopped over and was standing in the on-deck circle with him. “See the bird?” he asked, smiling shyly. Time only worked right when it had somewhere to go. Ideally, the future got to be the future and the past knew its place. But to any New England baseball fan, which was to say, just about anyone in New England, the past [John Henry] was looking around the ballpark, taking in the details. He spotted Jason Varitek in the on-deck circle, getting himself ready, and then noticed a small bird that had hopped over and was standing in the on-deck circle with him. “See the bird?” he asked, smiling shyly. I enjoyed this Red Sox perspective book. Kettmann's gets in the heads of various players, managers and front office people regarding the 8/30/03 Sox-Yanks game. He has brief bios of some of them but does not use those bios as a way to take up space; he stays with the story. One complaint is that it's really not one day at Fenway. He says next to nothing about ushers, vendors and things like what's it's like to feed 34,000 people hot dogs, etc., on a daily basis. I've seen a few coffee table phot I enjoyed this Red Sox perspective book. Kettmann's gets in the heads of various players, managers and front office people regarding the 8/30/03 Sox-Yanks game. He has brief bios of some of them but does not use those bios as a way to take up space; he stays with the story. One complaint is that it's really not one day at Fenway. He says next to nothing about ushers, vendors and things like what's it's like to feed 34,000 people hot dogs, etc., on a daily basis. I've seen a few coffee table photography books that have the "Day in the life of..." theme and was hoping this would be the print version of that. This is a fun read chronicling the Aug. 30, 2003 Red Sox/Yankees game at Fenway. The book is a quick, light read that makes a prefect gift for any baseball fan (particularly a Red Sox fan!) There are a lot of characters to wrap your head around in the beginning especially if you aren't familiar with all the CEOs, managers, owners, etc., but the cast of characters helps. Overall a light, fun read that I would recommend for baseball fans. While it is a story about a Sawx/Yanks game, it should be a must read for any baseball fan. A great book that shows the experience of several different people (Owners, players, managers, and fans) before/during/after a game. There are a lot of similarities between this and "Three Nights in August;" Although that is told from the managers perspective. Enjoyed the first half of this book a lot. The buildup to the game was great, but as much as I love baseball, once the book got into the play-by-play of each inning, it lost some of it's magic. Kettman narrates the game very well, but the first half talking about the people and why they were going to Fenway was just more interesting. Good read overall though. Great premise - the story of one day at Fenway Park (as the title suggests), following everyone involved, from the players and managers to the press and fans and including the guys who run the scoreboard. Unfortunately, the actual book did not hold up to this, and ended up being pretty boring. Shame. This took me nearly five years to complete because it was my summertime, front porch book. Great concept, well written - a great deal of fun, especially knowing what happened one year after the book was written - 2004 World Champions!!!! !